The safety of the people living, working, and recreating on former Fort Ord is the Army’s top priority. If you recognize any object that resembles munitions or explosives on or near former Fort Ord property, retreat to a safe location, and report the finding to 911 or local law enforcement. Metal detection is prohibited on the former Fort Ord due to the potential for remaining explosives hazards. The Army offers military munitions recognition and safety training to anyone digging holes or disturbing soil (in areas where land use restrictions do not prohibit digging) at the former Fort Ord property. A UXO technician or safety officer is available to conduct a twenty-minute training session. This training session includes information on what military munitions might be found and the procedure to follow if something is found. There’s no charge for the training. Click here for a flyer includes information on how to request the training. If you recognize any object that resembles munitions or explosives on or near former Fort Ord property, retreat to a safe location, and report the finding to 911. The Army is also collecting the information as a part of the on-going review of the safety program at the former Fort Ord. Please click here to complete a form to provide details to the Munitions Response Program Site Manager. This form is used to assist in the recording and investigation of MEC incidents. Note: Completing this form does not constitute emergency (911) notification. To download a copy of the Fort Ord Safety Alert for munitions, click here. The Department of Defense developed a Munitions Response Site Prioritization Protocol, also called MRSPP, as the methodology for prioritizing sites known or suspected of containing munitions and explosives of concern for response actions. The Department of Defense developed this protocol through a collaborative process with the States, participating American Indian and Alaskan Native Tribes, and federal agencies, collectively known as stakeholders. The Army applies the protocol to known munitions response sites. For more information on this program and how to be involved, click here. 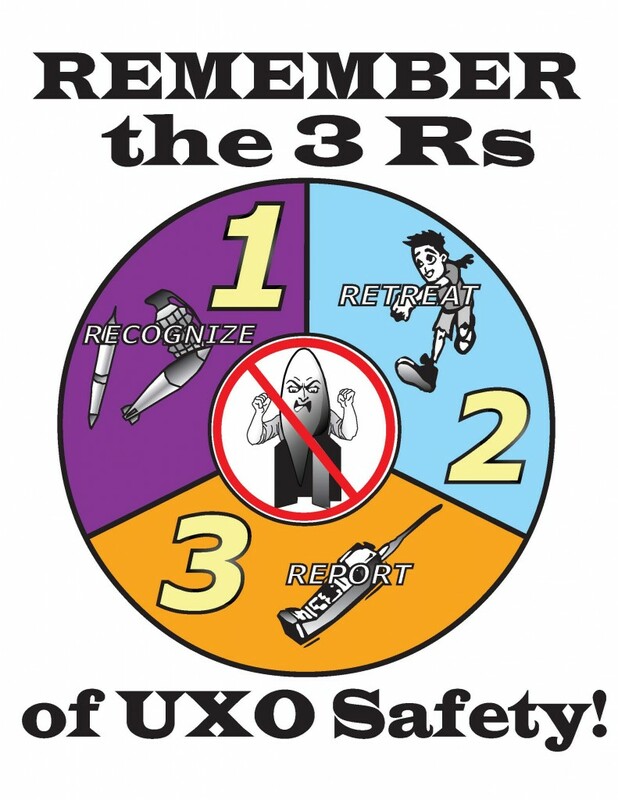 Remember the three Rs of UXO safety!